A high percentage of existing homes have air duct systems that contain small holes and cracks that reduce the level of comfort and increase heating and cooling costs. Perhaps some rooms in your home are colder than others or hotter than others. 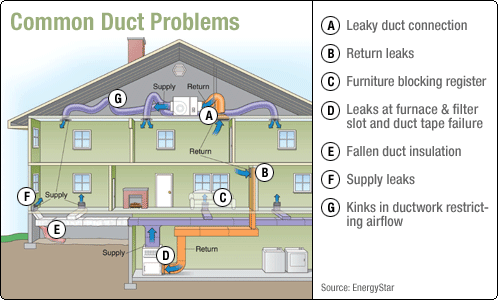 This is due to leaks in your home’s duct work. If you are struggling with high temperature variations between rooms and floors, let the DuctMedic’s come patch up any small air holes in the ducts with areo duct sealing technology. Does your home also experience?